Believe it or not, things just got even saucier at Princeton’s Hoagie Haven. The culinary hotspot has recently started bottling and selling Sanchez Sauce, the staple ingredient in its legendary – and aptly named – Sanchez Sandwich. A fresh Italian roll filled with chopped chicken cutlet, fries, mozzarella sticks, and American cheese, the Sanchez Sandwich is beloved both near and far for its lively sauce that combines the kick of hot sauce with the creamy flavor of honey mustard. The bottled Sanchez Sauce not only allows diehard fans to take the cherished condiment home, but it also helps tell the Hoagie Haven story. The bottle’s logo is the outline of a man’s face bearing a mustache and straw hat. The mustache pays homage to co-owners Mike, Niko, and Costa’s father, Mr. Maltabes, who proudly sports a handlebar ‘stache. The hat is the Boater Hat that has been worn by the Princeton University Band since the 1950s. Perhaps the greatest aspect of the logo is the font, which was written using actual Sanchez Sauce (good to know for any PU students short of a pencil). 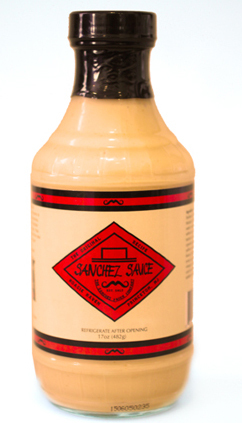 Bottom line, the 17 ounces of bottled Sanchez Sauce offers an all-purpose sauce that pairs well with anything from, burgers, meats, and French fries to vegetables and seafood. Since we like to provide you the best of Princeton, we’ve started to sell Hoagie Haven’s bottled Sanchez Sauce on our online store. Click here to purchase your bottle just in time for the Super Bowl!